In this page we will provide spring MVC HandlerInterceptor annotation example with WebMvcConfigurerAdapter. HandlerInterceptor works similar to the servlet filter. Servlet filters are more powerful than HandlerInterceptor. Filters are configured in web.xml and HandlerInterceptor is configured in spring application context xml file or java configuration. HandlerInterceptor can be used to avoid repetitive handler code. We can use HandlerInterceptor for different purposes like authorization checks, locale checks etc. In java configuration, WebMvcConfigurerAdapter has a method as addInterceptors in which InterceptorRegistry is passed as an argument. Using InterceptorRegistry.addInterceptor(), we add our interceptors and using InterceptorRegistry.addInterceptor().addPathPatterns(), we provide path pattern specific to given interceptor. If an interceptor has not been provided with any path pattern, it is called for each request. Spring provides HandlerInterceptorAdapter adapter class for implementing only required handler methods of HandlerInterceptor. HandlerInterceptor has three methods. preHandle(): It is executed before actual handler is executed. postHandle(): It is executed after handler is executed. afterCompletion(): It is executed after the complete request is finished. In our example, we are creating two interceptors, one using HandlerInterceptor and another using HandlerInterceptorAdapter. In our controller, we are creating two methods with different path pattern. We will configuie our interceptors one without any path pattern and another with a specific path pattern. Find the software and tool, which are using in our demo. Find the Gradle used to resolve JAR dependencies. We will create the Interceptor implementing HandlerInterceptor interface. We need to override all the three methods preHandle(), postHandle() and afterCompletion(). For the example, we have create an interceptor for logging. Spring provides adapter class as HandlerInterceptorAdapter of HandlerInterceptor interface. Using adapter class, we can implement only required methods. In our example, we are creating interceptor for transaction methods and using the preHandle() implementation of HandlerInterceptorAdapter. 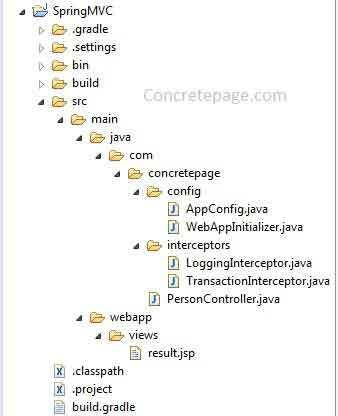 In java configuration class, we need to extend WebMvcConfigurerAdapter. To add our interceptor, we override WebMvcConfigurerAdapter. addInterceptors() method. Find the code snippet. For a specific path pattern interceptor, we can use addPathPatterns() method. If we do not add path pattern for an interceptor, that will be available for every request. In the above code snippet, LoggingInterceptor is for all path pattern and TransactionInterceptor is only for /person/save/ path pattern request. Find WebApplicationInitializer class implementation for spring DispatcherServlet initialization. In the controller we are creating two methods, one of which will be mapped with the path pattern defined for TransactionInterceptor. Here only LoggingInterceptor will work. Here LoggingInterceptor and TransactionInterceptor both will work.